A bizarre bounce, a strategically placed chunk of ice or pile of snow, a fortuitous deflection off a shin pad ... pond hockey games can be won and lost and in the strangest and most happenstance of ways. 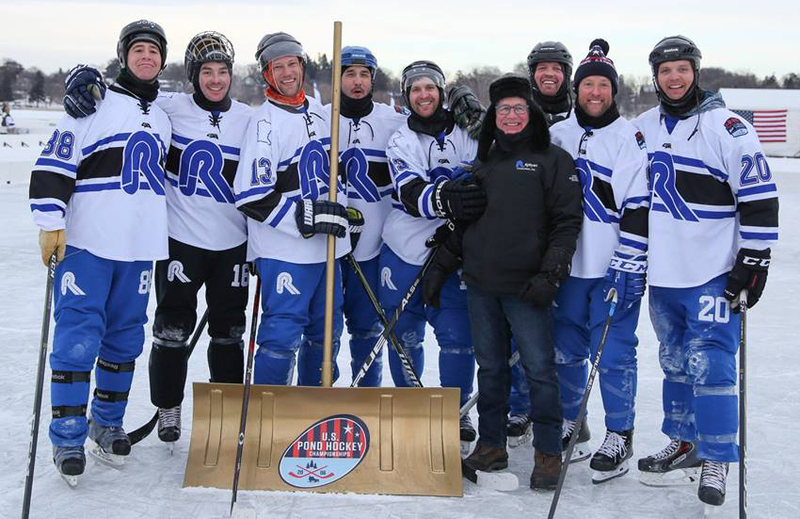 Yes, R.J. Ryan Construction’s fate early in the knockout round of the U.S. Pond Hockey Championships on Sunday on Minneapolis’ frigid Lake Nokomis hinged entirely on a disc of vulcanized rubber tossed high into the air. Team captain Nate Ryan called heads. Heads it was, securing victory over Lago Taco after the teams had played a scoreless overtime period. And on R.J. Ryan Construction played, all the way to the Open Division championship game where it beat Lululemon 5-2 to earn the team’s first title in its nine years of existence. R.J. Ryan Contstruction’s championship not only halted a three-year stranglehold on pond bragging rights by Wright Homes-Four Star Hockey but also confirmed a longstanding belief held by most everyone who has played a game that seemingly rewards rabbits’ feet and horseshoes as much as it does strong skating and straight shooting. “Pond hockey gods are real,” R.J. Ryan Construction defenseman Tim Hartung said. Of course they are. But talent is real, too. And there’s no doubting R.J. Ryan Construction has stockpiled enough of it to withstand most of the fickle swings of fortune prevalent in the pond game. 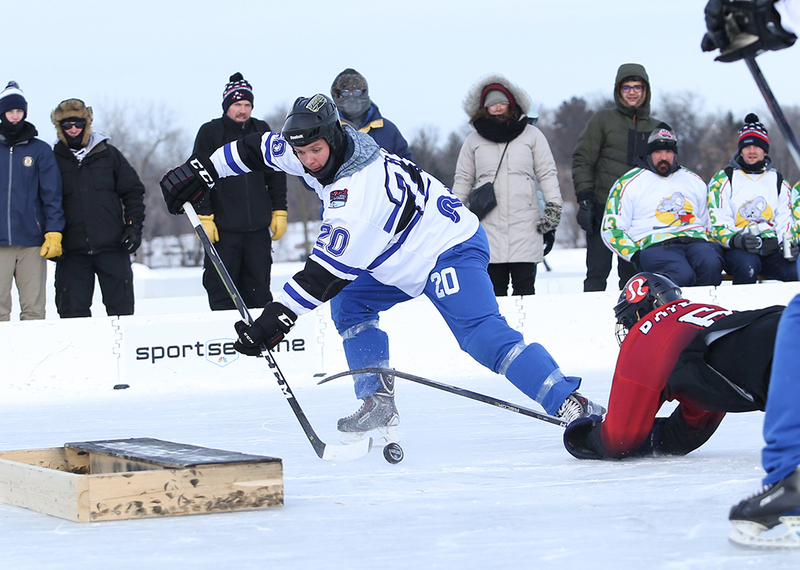 The team consisting of several Eastview High School and University of St. Thomas graduates has made numerous deep runs in the event, highlighted by a 2016 appearance in the championship where it lost 4-3 to Wright Homes-Four Star Hockey. R.J. Ryan Construction’s Jordan Fulton opened the scoring early in the first half, and the early lead ballooned to 4-0 after goals by Dustin Fulton (Jordan’s older brother), Todd Alexander and Nick Pernula. Mike Kramer scored late in the first half to pull Lululemon to within 4-1. Jordan Fulton, who played collegiately at Minnesota-Duluth, scored again early in the second half to make it 5-1, and R.J. Ryan Construction’s defense, led by the unflappable Hartung, took over from the there, allowing precious few scoring chances and just one more goal. At about the same time R.J. Ryan Construction’s fate was determined by a flipping puck, Lululemon sent shockwaves throughout the pond with its round-of-16 triumph over eight-time champion Wright Homes-Four Star Hockey. Lululemon’s 4-2 victory had the crowd inside the event’s massive warming tent buzzing with reaction to the slaying of the pond’s longtime giant. Lululemon’s Luke Flicek, a newcomer to the team that lost 5-1 to Wright Homes-Four Star Hockey in the 2017 title game, said the reaction was overwhelmingly positive to the stunning victory. “Everybody is cheering for the team that is playing against Wright Homes,” Flicek said. “I was getting a lot of taps from guys I know, congratulating us for beating them. My phone was buzzing a bit from some buddies texting me saying great job. 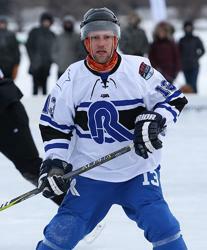 Compared to previous years, the title game was a mostly friendly exhibition of high-level skating, stickhandling and shooting skill. Flicek said several players had friends on the opposing teams. He and Hartung, as an example, are cousins who grew up playing youth hockey together in Apple Valley. Sheesh! Wine, a team featuring several former Edina High School standouts, won the Cedar Division championship with a 22-7 victory over NWO Wolfpack. Sheesh! Wine was the top seed in the 64-team playoff bracket after going 4-0 with 86 goals for and a goal differential of 70 in pool play. Both teams had to win five games on Sunday just to reach the title game, a brutal test of stamina. … Tradition Mortgage won its fifth-straight 40-Plus Division title by beating 10 Meter Radius 4-2 in a rematch of last year’s championship game. … Lululemon, a team comprised mostly of former Olympians and national collegiate champions, including the likes of Natalie Darwitz, won the Women’s Division for a second straight year with a 6-2 triumph over Orangetheory Fitness. ... Park Town Team beat No Regretzkies 17-5 to win the Rink Rat Division.